It is with great excitement that we’d like to announce that CloudApps has been shortlisted for a prestigious National Technology Award under the Innovative Enterprise Product of the Year category. The second annual National Technology Awards celebrate the pioneers of technology and innovation excellence in the UK and it’s an honour to be counted amongst the candidates to be appointed to win this prize. The National Technology Awards celebrate the pioneers of new technology, focusing on innovation in areas such as finance, travel, gaming, IoT and analytics. Winning entries come from those companies and organisations who have made outstanding technological contributions across a variety of sectors. Our product, SuMo has made it onto the shortlist thanks to its innovative behavioural tracking capabilities. SuMo delivers sales leaders three capabilities that power them towards their revenue and margin targets. The key to all three is the ability to track ‘high-value sales behaviours’. These are the positive sales behaviours you want to promote more of and the careless behaviours you seek to eliminate. The results are a clean and healthy pipeline, a smarter & fitter sales team and increased forecast accuracy. How does it work? 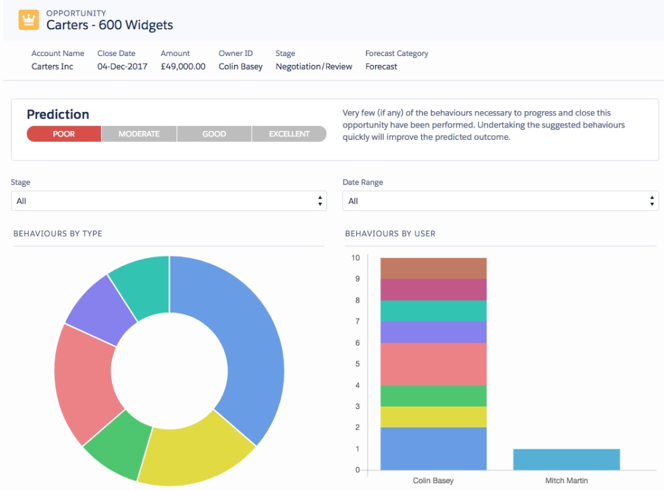 SuMo creates a data driven picture of rep and deal health, offering clarity and peace of mind to sales leaders. The system addresses the common and prolonged issue of forecast accuracy. The questions currently being asked about deals to qualify them in or out of the sales forecast are understandably limited and often subjective. They are limited to the data picture that is available to them today. That picture is weak, based on tactical tasks recorded in CRM systems and often incomplete. SuMo bolsters the data we track about a deal over time, including both the high-value and the careless sales behaviours that have been applied to a deal. This automated approach silently builds a rich picture of what has happened as well as what has not. This insight uncovers the true health of a deal. On top of better data quality, SuMo helps businesses get more out of their sales process by improving reps’ use of the CRM system. There is no better way to boost engagement than by making deal health transparent. This is a picture that no sales rep wants to see. A late stage deal ranked as “Poor” - based on tracking sales behaviours over time. If deal heath is made transparent then the effects are dramatic. The rep knows that the wider team will be reticent to engage, resources will be deployed elsewhere, and it will cause tough questions from sales leaders. This scenario is one that will see the sales rep quickly scrambling to rectify. One thing is for sure, this late stage deal that might otherwise have found its way onto the forecast will quickly be removed. Consider the impact on deal quality if reps were being constantly coached with intelligent prompts that guide them on the best next steps for a deal. Prompts that help the rep to understand the positive behaviours that will move a deal forwards and the careless behaviours that hold them back. Transparent display of deal progress, intelligent coaching and teasing your reps’ competitive spirit are all key ingredients that increase sales rep engagement, increases their productivity and builds the picture of true deal health. If you’re looking for a native Salesforce application that can help you create better forecasts, offer your reps support & coaching opportunities through guided selling and fine-tune your entire sales process so you’re only putting your resources on the healthiest looking deals, watch this brief demo!